Our Spring 2017 Newsletter went out to our members and supporters last week. 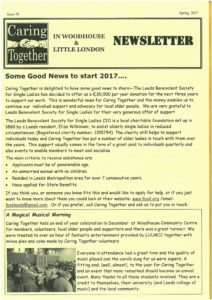 Lots of useful information and details of some of the things coming up at Caring Together in the near future. 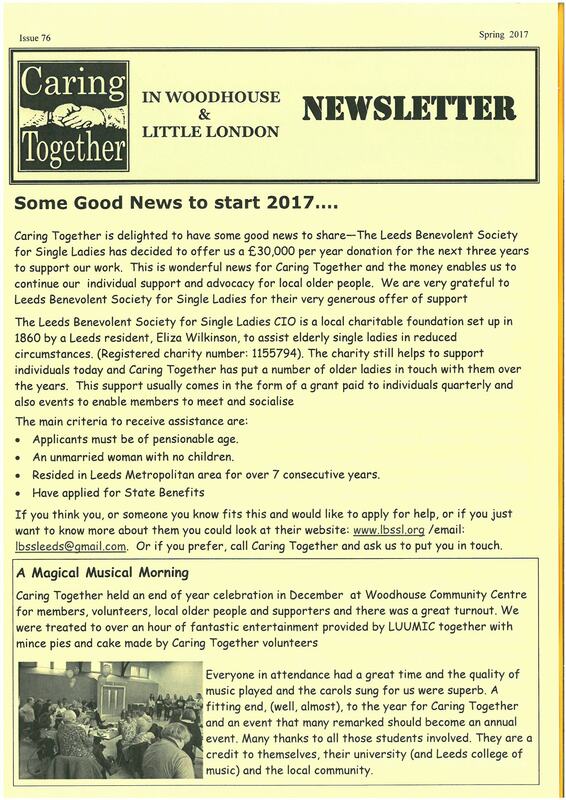 We send this by email to many of our supporters but most of our members like to get the paper copy, which as you can imagine is a lot of newsletters!! As always our Caring Together members and volunteers came to the rescue. 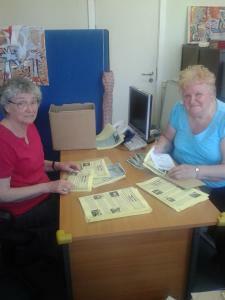 First we had a small team in the office sticking on labels and packing envelopes and then we had an amazing team effort to get the newsletters out to older people in the area. From delivering batches to a specific area or just dropping off a couple to neighbours it all added up to over 250 newsletters being either hand delivered or passed on in groups. This saved Caring Together almost £140 in postage costs!! 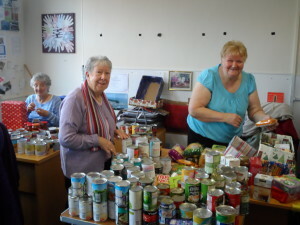 Caring Together volunteers to the rescue again. A huge thanks to those Caring Together volunteers who gave up yesterday morning to pack Christmas food hampers for our oldest members in Woodhouse and Little London. Festive cheer was in the air as Carol’s played and everyone was in fine form enjoying donating their time for such a worthy cause. 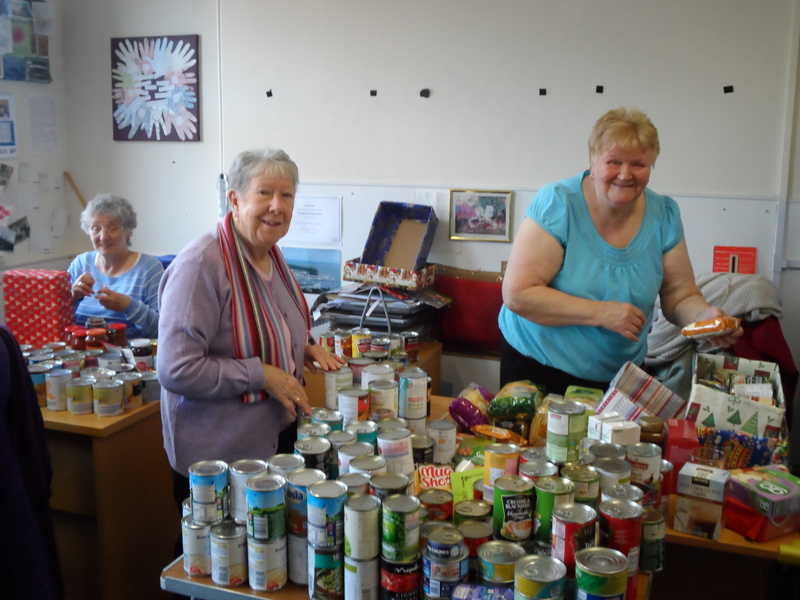 Many thanks again to the Grove Methodist Church in Horsforth and their parishioners for the donations of food items that made this possible. 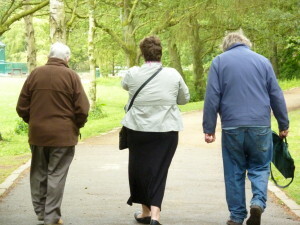 ………to stroll in the park and help us raise funds. Saturday 5th September is the date for our annual Sponsored Stroll. This event helps us to raise £hundreds for Caring Together’s work with local older people but we need your help. The more strollers we have, the more money we can raise so if you are free on the afternoon of Saturday 5th September please stroll for us. 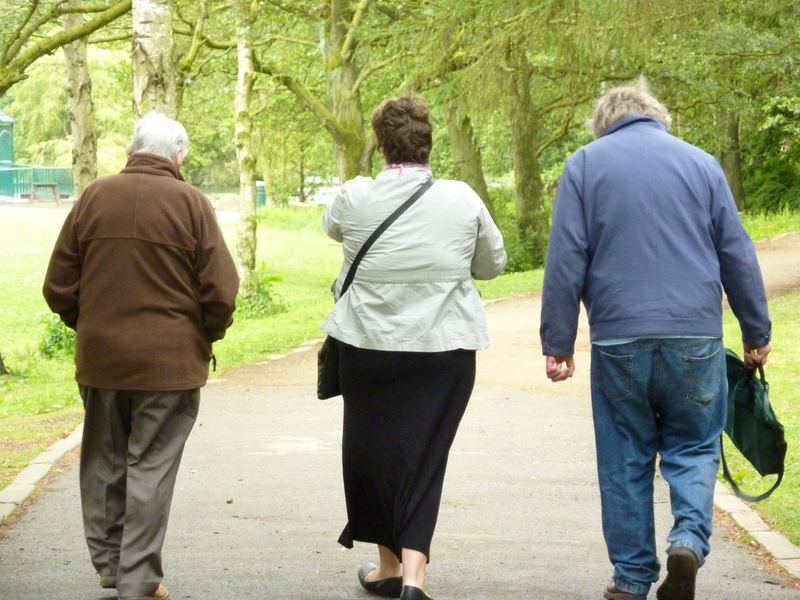 It will be a nice afternoon with friendly people, not too arduous – a circuit round the park (or more if you wish) and at the end a cup of tea and a certificate. We ordered the sunshine too – so fingers crossed! If you think you could stroll for us, please get in touch and we will send you a sponsor pack. If you can’t stroll on the day, please think about supporting us by sponsoring one of our strollers or making a donation. Our volunteers have been hard at work this morning putting our Spring Newsletter into envelopes ready for posting/giving out to our members and supporters. Some volunteers will be hand delivering some of them too to help us save on postage costs, some will be given out in groups and lastly some will go in the post or via email. 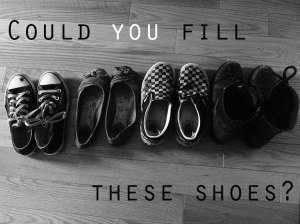 Whatever the method of getting to you, it should be with you very soon. 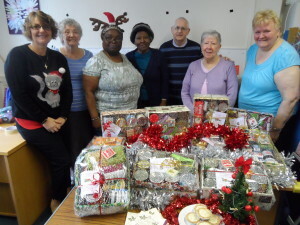 Thanks to the sterling efforts of Caring Together’s volunteers. If you can’t wait that long to read it then you can see it now by clicking the link above! David, Caring Together Walker, models the latest bag accessory for the discerning walker…also available in red or black…. 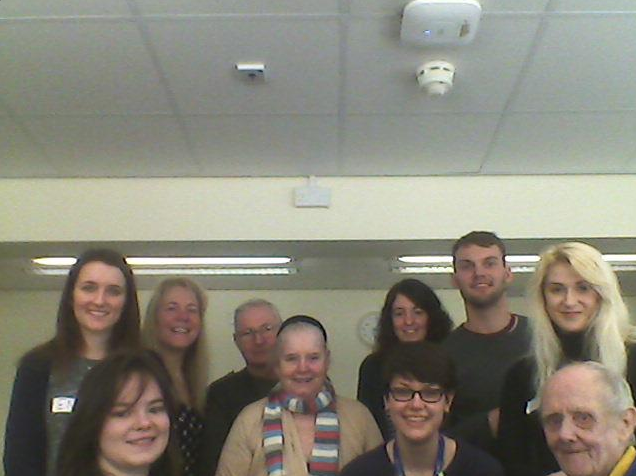 Many thanks to Lovell Park Hub, who gave us the space, to Leeds Library and University of Leeds students who gave their time for free to enable us to help some of our members learn that new technology is not always as scary as they might think it is – and to have fun! 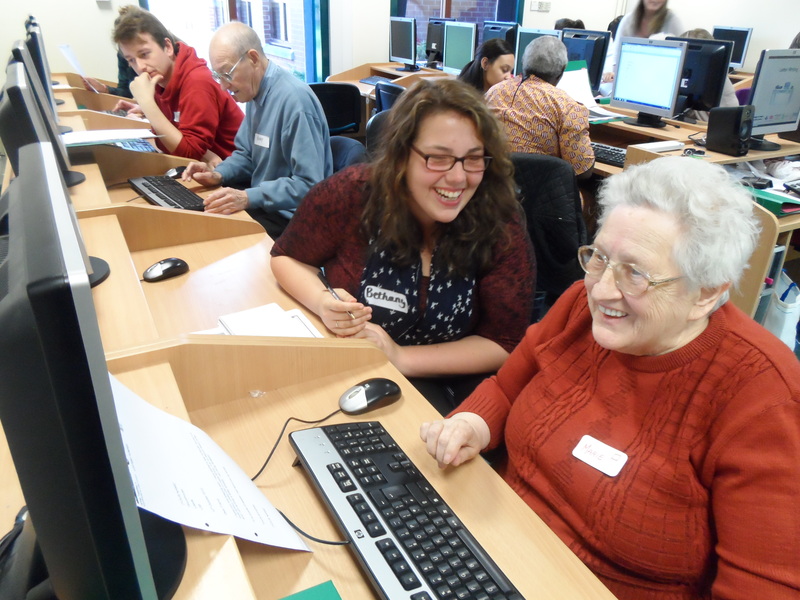 Often older people can be intimidated by the gadgets that the younger generation take for granted so it has been lovely today to bring the generations together to learn how to get the best out of their i-pads and just maybe open up a whole new world of opportunities! 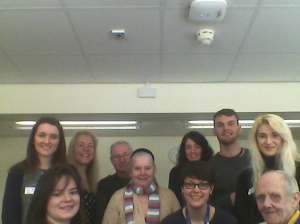 A big thank you to Liz Cable and Lorna Burns from Leeds Trinity University who were helping us learn how to make use of our website at the Social Media Surgery last night. Caring Together looking for a new Manager! Cherril, the Caring Together Manager, will be retiring next year after an astonishing 20 years at the helm! So, from today, the search is on to find our next Manager. If you think you, or someone you know, would be ideal for this job then please have a look at all the details on our vacancies page. 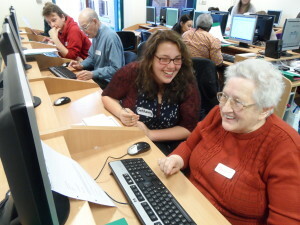 Our members of the Computer Group and our volunteers prove that you are never to old (or young) to learn something new. The group meets every fortnight and the discussions and content of each session are always varied and fun, dependent on their needs. 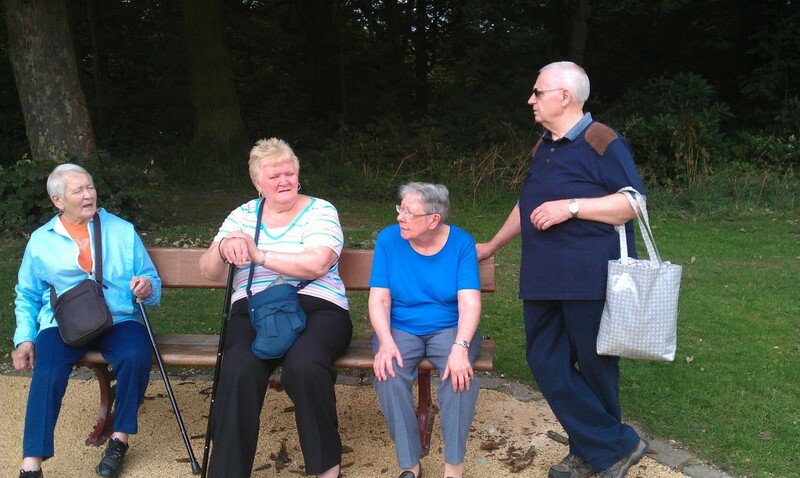 The session yesterday saw them each doing something different from searching for DVD’s, looking for decorators, listening to music from their own collection, and You Tube, sending emails, catching up on the latest news via BBCi player to watching Rugby and East Enders. Some of our members also updated their profiles on Facebook, with another exploring some online dating! Safety is also paramount and something we never take for granted. You might think this is nothing remarkable and probably for some just an average day but for our group it is remarkable because we have been with them all on their learning journey, from not even knowing how to switch on a computer, to now confidently navigating around their own computers, and the internet, and in some cases helping each other, and us as staff and volunteers too, which is always a delight. Anyone over 60 and living in the Woodhouse and Little London area wishing to know more about this group or our beginners classes then do get in touch we would love to hear from you.